Six consecutive week series designed to provide professional learning at your pace. This series is delivered virtually with classroom implementation and demonstration of competency. The series is designed to take approximately 1 hour a week (asynchronous) in addition to classroom implementation. Instruction will be delivered virtually using Zoom Virtual Conferencing and Google Classroom. Each week you will have an opportunity to participate in the 1 hour session. If you are unable make the session, no worries, you may view the session recording at a more convenient time. Your facilitators will be available through email and Google Classroom. 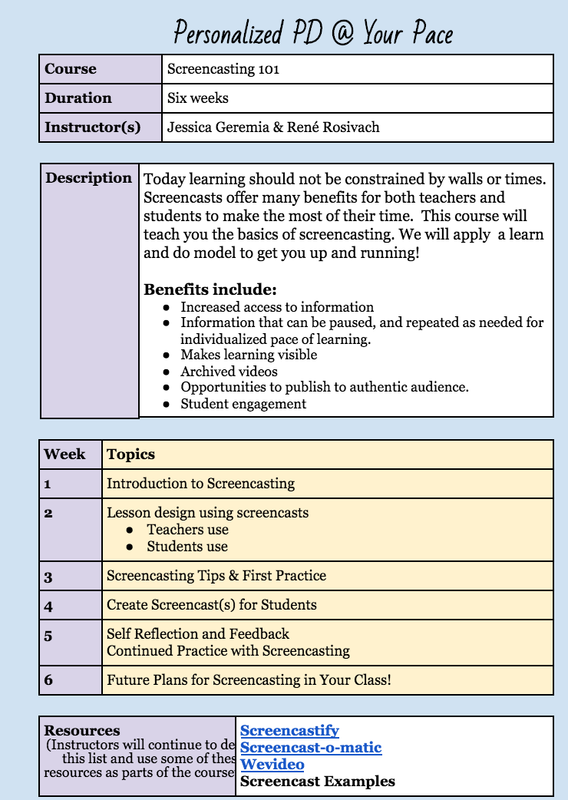 Video tools such as Screencastify are great for station rotation, flipped classrooms, and students explaining themselves before and after a course to demonstrate learning and improvement. Students can record themselves practicing language, giving a speech, and talking through problems. These tools will help you to provide thoughtful, personal feedback by recording yourself reviewing student work. Facilitator: Educators facilitate learning with technology to support student achievement of the ISTE Standards for Students.